This advanced software is our take on the Laboratory Information Management System (LIMS), supporting key lab operations with a clean user interface and simple, easy to use controls. Labline is a perfect choice for the modern laboratories at all stages of the rubber production process, offering a systematic network of connectivity for multiple rubber testing instruments to a universal ODBC centralised database. Thus allowing essential test data to be managed and collated automatically. The extensive database connection option supports many established databases; Microsoft Access ®, Microsoft SQL Server ® and IBM DB2 ®. A version of Labline comes as standard with any Prescott Instrument rubber testing equipment, as part of our commitment to you. Labline comes pre-installed on the latest computer hardware and developed for Microsoft Windows ® OS. Labline can be installed on any PC on a network and be connected to an ODBC central Labline database. This allows viewing and manipulating of all results in the database without having to be physically connected to the instruments; this is a vital lab manager tool. 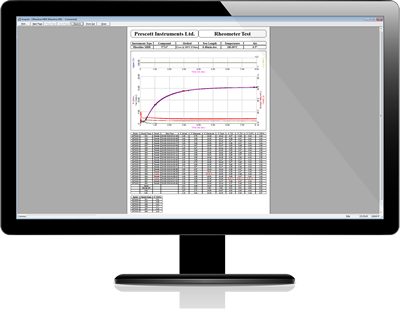 The software can be configured to automatically pass or fail tests based on predetermined gates on any of the test points. These limits can be set either manually or calculated automatically based on result history and to any value of Standard Deviation. Suited for standard quality control checks, the trend of results of an active compound and test can be viewed at any time. 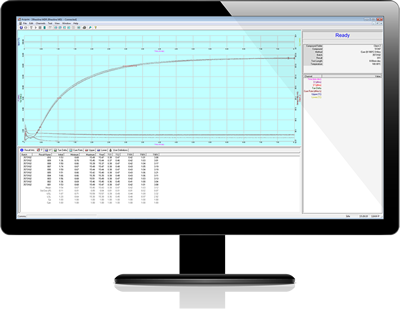 A Trend chart will be created for each individual test point, with a clear display of user-defined number of results, along with any upper and lower limits that may exist. Test Results can be exported to .csv files for further analysis using Microsoft Excel ®, Quality Analyst SPC or any other analysis tool. Our built-in reporting system allows any number of tests and selected test points to be added to the printed report. The system can be programmed to automatically create a report after a set number of specific tests have been carried out. A quick report function also exists which creates a report immediately after a test is saved. Want to design your own report? Our FlexiReport package can allow you to do just that. As standard, Labline is deployed with a Microsoft Access Database on the operating PC’s hard drive. Alternatively, the database can be transferred to a network destination. Labline supports more sophisticated database management tools such as SQL Server ® and DB2 ® as an optional upgrade. Please enquire for more details. Labline supports multiple languages including: English, German, French, Italian, Spanish, Russian and Chinese. Each test specification offers a choice of input and output units. Torque Units include dNm, Ibs/In2, kg/cm2 and MU. The software is easy to set-up and configure on a range of instruments, connecting through USB or RS232 serial ports. Labline is designed and built for our instruments as well as being compatible with other established instruments, some may require our ‘Red Box Interface Unit’. Conditions the signal and converts it to a serial format. Labline typically is packaged with a Microsoft Access ® Database, but has the capabilities to support other more sophisticated database management tools such as Microsoft SQL Server ® and IBM DB2 ® as an optional upgrade. To request a demo version of our Labline, please fill in the online form below and our software support team will get back to you.